In honor of National Adoption Month, we’re featuring a few stories about adoptions and adoptive families. 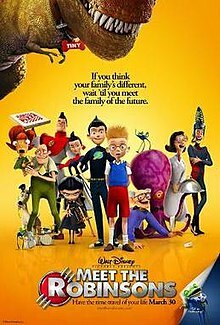 In Disney’s Meet the Robinsons, Lewis is a twelve-year-old inventor who lives in an orphanage. When another boy shows up at his science fair saying that he has a time machine, Lewis sees an opportunity to fulfill his dream of finding his mother and learning why she abandoned him at the orphanage. All that sounds pretty serious, but then they go to the future, encounter a dinosaur, and lots of other mayhem. This is a fun movie with a solid inclusive theme about how families come in all shapes and sizes. Go to a science fair. Learn more at Adopt US Kids or Child Welfare Information Gateway. Next Adoption Week: Modern Family.